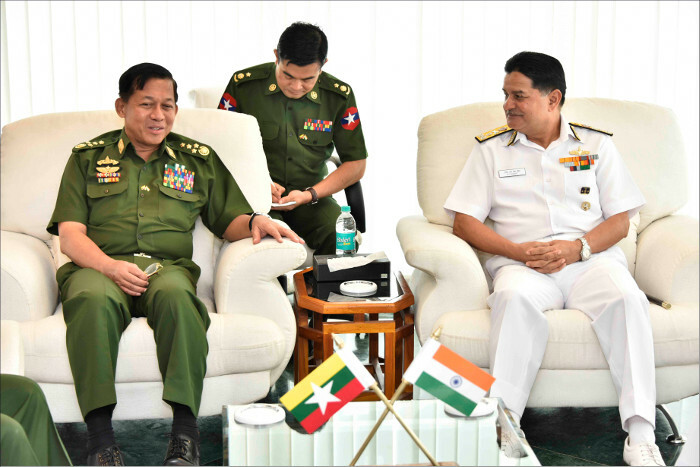 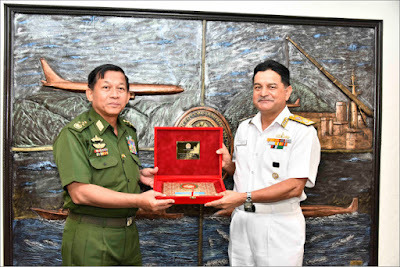 Senior General Min Aung Hlaing, Commander-in-Chief, Myanmar Armed Forces, accompanied by his wife Mrs Kyu Kyu Hla and a fifteen member high level delegation including Lieutenant General Soe Htut Commander Bureau of Special Operations and Chief of Military Security Affairs, Rear Admiral Moe Aung Chief of Staff (Navy) arrived at Visakhapatnam on a three-day visit to the Eastern Naval Command (ENC) from 11 to 13 July 2017. The Senior General interacted with Vice Admiral HCS Bisht, AVSM, Flag Officer Commanding-in-Chief, ENC and held discussions on 12 July 2017. The delegation was briefed on the role and function of the Command. 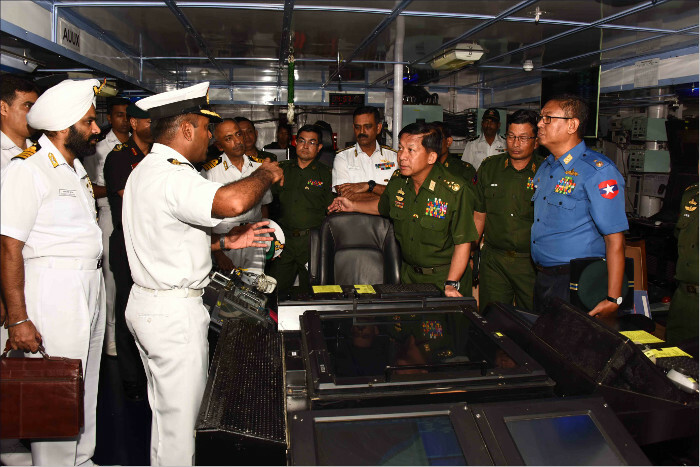 Later, the delegation visited INS Satpura, a submarine and important establishments of the Command and were briefed on various naval training facilities at Visakhapatnam. 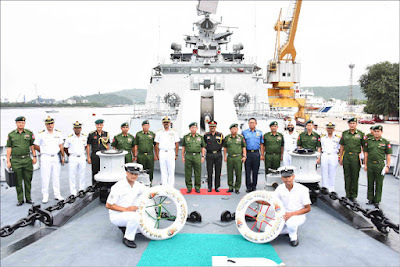 The Senior General also visited Coast Guard Ship Samudra Pehredar and witnessed the pollution control demonstration. 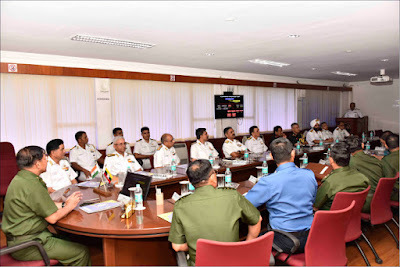 Mrs Kyu Kyu Hla interacted with the Committee Members and ladies of the Navy Wives Welfare Association(NWWA) (Eastern Region) and visited the NWWA facilities during her stay at Visakhapatnam. 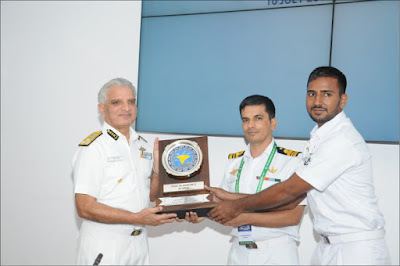 Indian Naval Ship Sumitra was awarded a Special Search and Rescue (SAR) Award by Chairman, National Maritime Search and Rescue (NMSAR) Board during the XVI NMSAR Board meeting on 10 July 2017 at New Delhi for saving lives of 33 Bangladeshi fishermen. The SAR effort undertaken by INS Sumitra in adverse sea conditions post Cyclone ‘Mora’ demonstrate the resolve and capability of the Indian Navy towards assisting mariners and fishermen beyond boundaries.